Always have all your darts and accessories at hand with this durable nylon case. This case is available in two sizes and both have nylon zipper openings. The large case (5" x 8 3/8") holds up to three sets of darts and twelve sets of flights. A fold-out flap gives you three roomy pockets for carrying all those extra essentials such as shafts, tips, wrenches, etc. 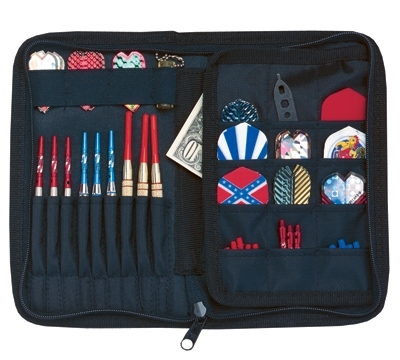 The smaller case (4" x 6 3/4") holds two sets of darts, eight sets of flights and has one pocket for accessories.